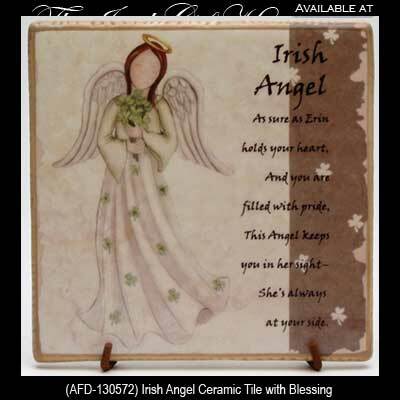 This Irish angel blessing plaque is detailed on a ceramic tile. She’s always at your side. This Irish blessing plaque features an angel with shamrocks on a ceramic tile. The Irish blessing tile measures 5" wide x 5" tall and it is ready to hang on your wall or stand with the included easel; it may also be incorporated into a tile design on your wall or counter top. This Irish blessing angel is gift boxed with a shamrock history card that is complements of The Irish Gift House.